The UK citizens who have made our lives in Europe are still being held hostage, more than two years after the Brexit referendum, and nothing – absolutely nothing – has been done to reassure us or provide practical advice about our future post-March 2019. For this reason, the organisation that I belong to, British in Europe, has stopped sitting on the fence and declared itself to be against Britain leaving the EU. Many of us are now actively campaigning for a second referendum, sometimes referred to as a People’s Vote on the deal, now that the British public is presumably more aware of the disaster that awaits them. There is a lot of work still to be done to achieve this Remain in EU vote and force the government to recognize the game has changed and the people must be allowed a say on their future. As soon as a second referendum is announced, the next step will be a massive campaign to ensure a Remain victory. Apart from the fact that the demographic has changed since 2016 (with more young people voting for Remain, and older voters who helped the narrow majority for Leave dying off) the key to a Remain vote is going to be getting the facts across to the undecided or turning the resolve of the suicidal diehard Leavers. In this work, there is a very successful initiative called 3 Blokes in the Pub which has gathered great momentum on social media in the past weeks. If like me, you are neither on Twitter nor Facebook (I long ago deleted my accounts) you may never have heard of 3 Blokes in the Pub and I would like to recommend listening to them as a way to build up your understanding of the facts, ready for the second public battle of Brexit: the Battle to Remain. I chanced upon 3 Blokes in the Pub because I saw James J. Hunter mentioned in comment threads in the Guardian. Such comments as “Why don’t they get James Hunter on the BBC Today programme? He’d make mincemeat of Jacob Rees-Mogg” etc. But I had no idea who James Hunter was! I did a little searching on Google a few weeks ago and found that James Hunter was the international trade expert of 3 Blokes in the Pub on the YouTube videos of the same name, which many people have tapped into through Twitter or Facebook. So-called ‘social media’ is quite antisocial for those citizens who object to organising our day around Twitter or feel that Facebook is a dangerous intrusion into our liberties. But if a major conversation is just taking place on social media and not in the mainstream broadcast or print media, you can easily miss it. Here’s episode 1, but be warned it is technical and an hour long. These guys really do know their stuff. From this introduction we learn that James J. Hunter is an experienced international trade negotiator, and we also learn that many of the glib pronouncements by people such as Jacob Rees-Mogg (the ringleader of the anti-EU group in Parliament) can be easily challenged by the facts. After the success of 3 Blokes in the Pub, James Hunter made some appearances on radio and television – where his devastating command of the facts about international trade negotiation instantly took the wind out of the sails of any hapless Brexiteer put up to argue against him. Just by talking facts and not waffling about the sunlit uplands in which unicorns roam after a painless exit from Europe. Since the initial success of 3 Blokes in the Pub there has been a campaign to fund them properly to go off to places like Brussels and Geneva (HQ of the World Trade Organisation) and tell us the facts, in a way the British Government has failed to do. I’m simply bringing this to the attention of a wider audience – particularly those not on social media – and hope you will find it useful. Click on any of their YouTube videos to get started and the rest will appear in sequence. My only criticism is that the videos are all too long, while packed with useful information, and it takes a while to wade through all the information, which needs to be made available in print form somewhere, in a structured booklet that can be used for reference. Please be aware, this blog post is aimed solely at informing Remainers, not arguing with Leavers. Any comments expressing a Leave view will simply be deleted. This is war now. Thanks. It just so happens that I’m a Brexiteer, but it’s your blog, and you’ve laid down the ground rules, so I’ll respect your wishes and refrain from mounting my horse – high or otherwise. The point I’d like to make is that EU nationals currently living in the UK have been assured that they will have the right to remain in the UK after we leave the union. I would have thought that this assurance should have been reciprocated either by individual countries or the EU on their behalf; is this not so? Failing that, of course, you might well receive your Spanish citizenship before then, although I can understand the concerns of those expats who wish to remain as Brits. Not it is not so, Simon. Plus the added complication of tbe UK creating its own rules on citizenship after Brexit will encourage EU countries in which we expats live to make their own reciprocal difficult rules about registration for us. Thank you for your restrained Brexitism but none of it makes sense. Actually, since you seem like a polite Brexiteer, wot is a rare beeste indeed – let’s abandon my “No Brexiteer” rule and continue this discussion. I guarantee to publish your comments unedited and to discuss the matter purely on the facts, without the shouty nonsense that is everywhere online. OK? Well now, it must be over 60 years since I’ve been set an essay to complete on pain of failing a test! To tell you the truth, I’m not able to complete the sentence you started, because I understand that it will be impossible for everyone in the UK or expats in the EU to benefit from Brexit. Life just ain’t like that is it? Politicians and extremists are the people that pretend to see every problem (or opportunity) in terms of right or wrong, whereas your Joe Public with half an effective brain cell will realise that there are infinite shades of grey to be sorted before a sensible choice can be attempted. Even then, there’s a fair chance of it all going pear shaped and eye wateringly expensive. TSR2, Concorde, ERM, Greece joining the Eurozone, huge aircraft carriers with no aircraft, anybody? In the first referendum, I was all for joining the Common Market, which to my uneducated mind, would be the best solution for unity and free trade between all the member states. The first seeds of doubt were sown when the UK was told that it was necessary to tear up all the trading agreements we had with the Commonwealth and we would not be allowed to trade independently with our traditional partners, leaving them to suddenly earn their crusts wherever they could. That wasn’t what I had signed up for, and at the time was thoroughly ashamed of the shabby treatment dished out by my own country to their own kith and kin. That was like abandoning your own family when they needed security. Thankfully, they seem to have survived quite nicely without us, so let that be our inspiration. It can be done. I still believe that the EU’s ambition is to become the USE, maybe with a six monthly revolving presidency, but administered by unelected Commissarsxxx Commissioners (sorry, that was a cheap shot). I’m too used to being a member of a sovereign nation with an accountable (even if sometimes inept) government that can be fired relatively easily. My reason then for wanting out of the EU is principally a matter of distrust in the governance of the huge beast that it has become. I’d be quite happy for us to remain a member of the ECJ and an old style free trade area, but the deal is everything or nothing. So I’m out. Simon, I am immensely grateful to you for providing for us some insight into the great swirling mass of emotions that produces a Brexiteer! Hang on. We were all benefiting from membership of the EU quite happily before the Conservative Party started their civil war and dragged us all into it. But let that pass and look at your next point. This is the longing for an imperial (and post-imperial Commonwealth) past which is totally irrelevant in the modern trading world that we have lived in (I am probably your age) for the past half century. These are the misplaced longings that have produced fascism (the loss of empire produced the British National Party and the National Front, as a very natural consequence for lower middle class Britain. It was well documented. Your own words, “the shabby treatment dished out by my own country to their own kith and kin” is indicative of this. My kith and kin are the people of Europe. The people that Churchill wanted to bring together after World War Two in a United States of Europe. Yes, Churchill aspired to that in a speech in the mid 1940s. Long before the Common Market, he had proposed the whole project. You say, “I still believe that the EU’s ambition is to become the USE” and I have no problem with that. Or would you rather Putin’s Russia was dictating our future? Learn the preset day danger and fight it. Don’t replay the 78 rpm records of your youth. The Empire has gone, long ago. Your final statement is so full of contradictions it makes no logical or philosophical sense at all. Simon, what do we hope to gain outside of all this? Nothing. All your argument is negative, so I respond with a negative: we gain NOTHING. So why leave? Every government analysis is based on minimising the damage of Brexit. Your arguments are bankrupt. I’m sorry, you expressed them in a heartfelt way, but you need to get beyond the emotion and study the economy and real political questions of the modern world. Mum and I will be marching for the three of us on Sunday, in Liverpool! 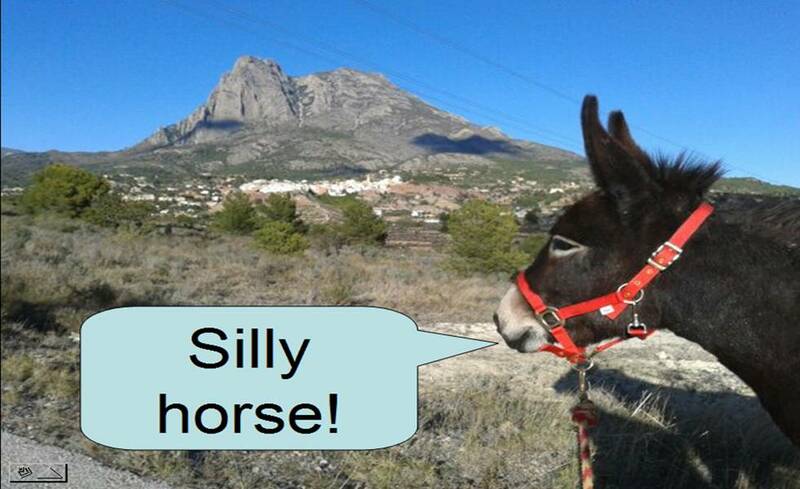 Shall we do some braying, or would that be going a bit far? If London can have a Wooferendum, we could start a Brayerendum?